I grew up on our land, in rural Ingham County, helping grow our small veggie patch and flowers, the only child of Paul and Rose Titus. "Helping" on the farm in those days was mostly playing with the cats or dog and letting my imagination run wild in the untamed woods surrounding the fields. Occasionally, I was interrupted by fetching something for mom and dad, or going to a farmers market only to sit under the table and observe. Times were not always great but, my parents made the farm work, while they maintained part to full-time jobs. As I grew, 4-H and later, FFA, shaped who I am and cultivated my sense of hard-work, born not of words but deeds, while pledging my hands to make the world a better place. The bills were mounting and seeds and supplies needed to be purchased for the following spring. Do I quit college and get a full time job? Do we let the bank have the farm only to forever lose my dream of coming back to the farm? Purchasing farmland is incredibly difficult for new and beginning farmers and I knew that the farm I loved would be lost forever. My dad probably wouldn't be well enough to help much that next spring but, we needed a way to create cashflow quickly. I had learned about the idea of Community Supported Agriculture from my instructors, Corie Pierce and John Biernbaum. With their help, I sought to start my own CSA, so that we would have enough money to stay afloat until I could harvest a few crops and dad was well again. 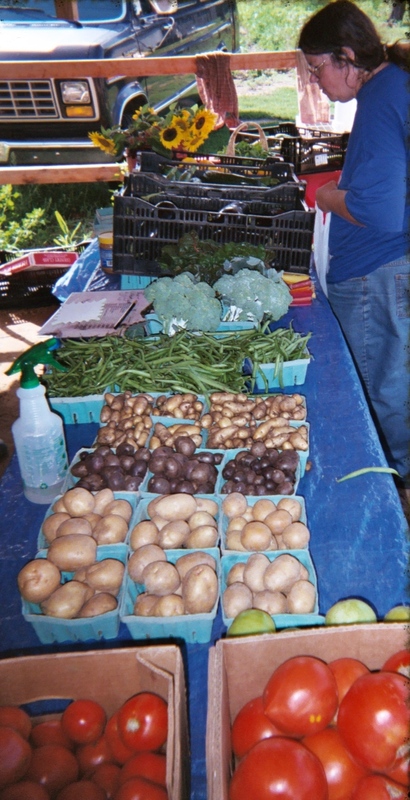 In the summer of 2006 the CSA was born! It's been a wild decade and I'm so thankful to have my family by my side. My parents are still heavily involved in day-to-day decisions, even as they reach their early 70's, a fact which amazes me every day. The farm will never be perfect but, we continue to try everyday to make it better, more sustainable and more resilient to the changes around us. I could never express how grateful I am to the families who eat our food and support our family, who helped us save our farm for the next generation. Our food is raised using sustainable, organic methods but, we are not certified organic. Using compost and natural fertilizers helps keep our soil healthy and productive while hoeing and hand-weeding keep us busy and the land free of herbicides. We feel keeping bees, chickens and natural habitat is an important part of our farm ecosystem. We hold our role as stewards of the land as the highest of priorities and do our best to keep this land healthy for generations to come. Respecting that we grow good food that feeds your family and ours, drives us. Taste is our ultimate guide. Maintaining a high quality for our products by reducing the time between when we harvest and when you eat is key. By using unique varieties of vegetables that cherish lost tastes, we keep our taste buds and tummies happy too. The first year started with three locations: Okemos, Lansing and on the Farm. With a little over 50 members, thus began the inaugural season of experimenting with numbers, systems and logistics. Those first CSA members were crucial in helping to refine the CSA system and communications, and ultimately, in teaching their farmers how to best serve them. We made lots of mistakes and learned a lot! In the second year, (still using dial-up internet folks) the CSA expanded to around 100 members and much stayed the same while we settled into this new role. The third year, we expanded to about 150 members and added Mason and East Lansing as distribution locations. Every year since we began, the CSA has expanded until, in 2009, the perfect number of 300 families was reached. Much has stayed the same since 2009 while our staff comes in and out, families move away and others find us. But, the farm now also partners with other local farmers to bring members meat chickens, tree fruit and eggs, to be distributed alongside their vegetables. CSA has provided a stable income for our family and the ability to make farming a full-time occupation not only for ourselves, but for others who want to learn about farming. Titus Farms was actually started in 1982 by Paul and Rose Titus. Both Paul and Rose grew up around Dansville, raising various animals and field crops as part of their respective family's farms. They also each helped maintain a family vegetable garden, a mainstay for farming families. They married in 1982 and started a life together on a small 20 acre parcel that Rose had purchased by herself. Paul grew up always wanting to be a farmer but, his family lacked land. He tried raising traditional field crops on rented acreage but, scale just wasn't on his side. Then, while carrying Rebecca, Rose developed chemical sensitivities. Together, with their broad knowledge of farming, they ventured into farming using only organic methods. Paul, always in need of a challenge, began to dabble in growing vegetables as well. While they found an ever increasing audience for the tasty vegetables the farm was producing, they also found they were enjoying raising these non-traditional crops and rearing their daughter in this environment. As the demand grew for their veggies and cut flowers, Paul and Rose expanded their acreage by renting land from friends, neighbors and relatives. The main drive for continuing to farm was for their daughter, Rebecca, whom they hope to hand the operation to one day. We're almost always need of a little help from our friends!